What Are the Big Factors Determining Whether Americans Support War? "Every time we get involved in somebody else's mess, we just get deeper in debt and nothing happens. They go right back to being just exactly as they've been for 200 years," said Dolly Benson, 71, of Romance, Arkansas. Last week my colleague Garance Franke-Ruta explored why Americans have gradually become less eager to engage in foreign conflicts since 9/11, including factors like reduced optimism for the Arab Spring and less outrage over chemical weapons. But beyond this surprising turnaround in American sentiment, the Syria issue has created some unusual bedfellows: staunch libertarians and anti-war Democrats; the French and the U.S.; the Turks and the Kurds. Indeed, Iraq-era alliances and partisan views on intervention don’t seem to apply anymore. So what makes both ordinary Americans and lawmakers support military action these days? The academic blog The Monkey Cage highlighted some great studies on this issue in a recent post; I’ve summarized some of their main points here and added some additional research. As a quick disclaimer: Public opinion and national security is a massive, complicated field of study, so this is far from comprehensive. 1. Congress’s partisan makeup largely determines whether it goes along with the president on military action. When the opposition party holds a large number of seats or controls one or both chambers of Congress, members routinely challenge the president and step up oversight of foreign conflicts; when the legislative branch is dominated by the president’s party, it generally goes along with the White House. In this case, Obama’s aggressive Syria lobbying campaign might partly be necessary because of the partisan opposition he faces in the House. 2. Everyday people tend to support waging war when political elites seem eager to do so. 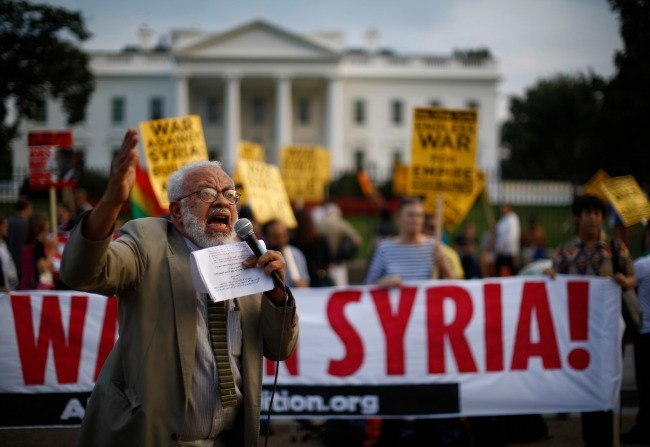 Just 20 percent of Americans in a recent Reuters/Ipsos poll said the United States should take action in Syria. Meanwhile, 76 percent of Americans supported the Iraq War before it began. Though one would hope that we’re basing these opinions on a careful calculation of the relative costs and benefits of intervention, that’s not really true, according to MIT political scientist Adam J. Berinsky. In a 2007 Journal of Politics article, Berinsky argues that rather than reading history books, articles on military theory, and/or Atlantic stories, Americans base our support for foreign wars on whether the policymakers we like want to intervene. 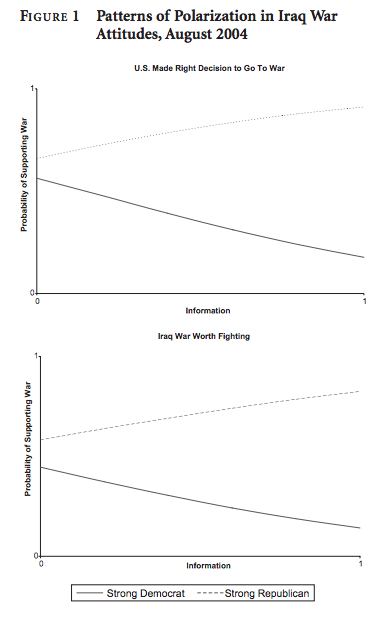 Looking at both World War II and the recent Iraq War, Berinksy found that citizens at the time had little knowledge about the particulars of the conflicts -- such as Nazi atrocities or American troop casualties -- and thus could not have determined the relative advantages or disadvantages of America’s actions there. Instead, people relied on cues from lawmakers and pundits, whose own, party-based beliefs in turn shaped the public’s. “When political elites disagree as to the wisdom of intervention, the public divides as well. But when elites come to a common interpretation of a political reality, the public gives them great latitude to wage war,” he explains. In the case of Syria, the media, strategists, and lawmakers are all deeply divided on the question of military action, so ordinary Americans aren’t sure what to think. 3. Regular people actually do listen to international bodies like NATO and the UN. Since we apparently have little knowledge of national-security strategy, it’s probably a relief that we at least care what other countries think we should do. A 2011 article in International Studies Quarterly found that, when asked about a hypothetical decision to send troops into East Timor in response to an attack by Indonesia, Americans -- particularly those who didn’t trust the White House -- wanted international bodies to weigh in on the plan for intervention. We find substantial evidence at both the aggregate and individual levels that the American public relies on the cues from IOs such as the UN and NATO to provide them with a ‘second opinion’ on whether they should accept their president’s statements regarding the wisdom and legitimacy of using military force. The authors say this explains why, in 2003, Democrats were far more likely to want international authorization for the Iraq War, while under the Clinton presidency of the 1990s, Republicans paid more attention to the perspectives of foreign allies than did Democrats. Today, France and Britain have come out in favor of intervention in Syria (though Prime Minister David Cameron lost a vote for military action in the U.K. parliament), which might help reassure Americans -- and potentially lawmakers -- who are skeptical of Obama’s case for missile strikes. NATO Secretary-General Anders Fogh Rasmussen has also said that he was “convinced” Assad had used chemical weapons, potentially offering the type of “second opinion” Obama might need to bolster his case -- although UN Secretary-General Ban Ki-Moon has been more cautious. 4. Veterans are less likely to support intervention than are non-veterans. But in cases when the U.S. does intervene, veterans are more likely to support using “overwhelming” force without restraint. Consequently, the authors found that as more and more veterans join the ranks of government, the likelihood of intervening militarily abroad decreases -- but the force used in each intervention is greater. We find that as the percentage of veterans serving in the executive branch and the legislature increases, the probability that the United States will initiate militarized disputes declines by nearly 90 percent. At the same time, however, once an MID has been initiated, the higher the proportion of veterans in the government, the greater the level of force the United States will use in the dispute. 5. We would probably have fewer military interventions if it was always up to Congress. Obama’s decision to turn the decision on Syria over to Congress is significant because historically, lawmakers are much less likely to take on foreign conflicts than presidents are. On March 23, 1999, the Senate passed a resolution urging the United States and NATO allies to attack the former Yugoslavia in order to stop Serbian forces from killing Albanians. The House refused to do the same, and one day later, NATO began bombing the former Yugoslavia. The very same day, the House passed a resolution which expressed support for American soldiers and made clear the reservations of some members of the legislature about the attack, but did not approve of the war. Just over a month later, it rejected a Senate vote authorizing the use of force against the Serbs by a tie vote. At the same time, the House explicitly rejected a resolution calling on the president to withdraw all troops from the conflict, and along with the Senate appropriated funds for the mission. One way Hanania explains this is through the phenomenon of buck-passing: If you really do support intervention as a president, not taking action means living with the guilt of violating your morals. After leaving office, Hanania points out, President Clinton said that his biggest regret was not intervening in Rwanda. Meanwhile, if you support intervention as a member of Congress, you can still vote with your party, or with the sentiment of your home district, and share the guilt of having not intervened with your fellow policymakers. 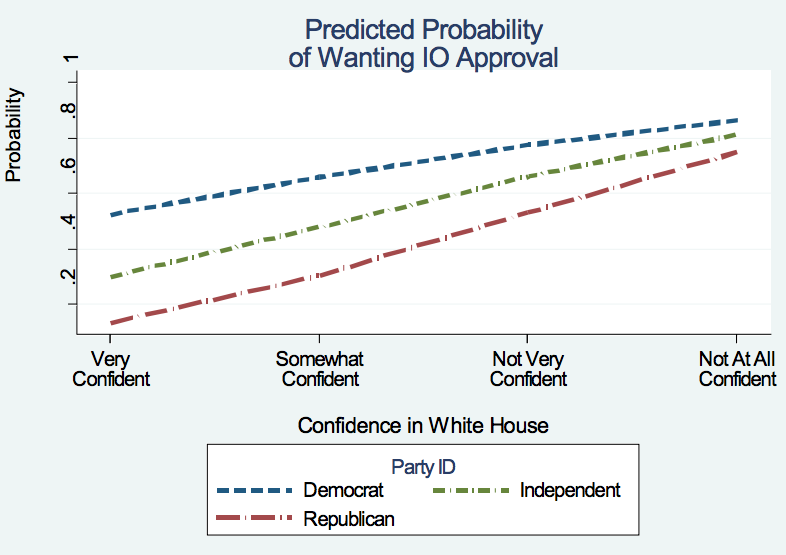 Other studies have found that the general public generally does favor intervening in foreign countries on humanitarian grounds, and that those opinion polls influence the way legislators vote. "Both the public and members of Congress understand and are motivated by the ethical and normative obligations of the international community in general and the United States in particular to step in and stop episodes of widespread human rights abuse," a 2012 study in the journal Foreign Policy Analysis found. However, that's actually another reason Congress members might be reluctant to act in the case of Syria: Their constituents are, too.